My daughter LOVES female superheroes and I LOVE making her superhero dreams come true. The other day she literally thought she was a superhero. She came home from school one day and told us that her friends had made fun of her because of her worn down shoes. To my surprise, she didn’t seem too affected, and so I kept asking for more details. After all, she’s a 5 year old who makes up a bunch of stories anyway, and I wanted to get to the bottom of it. We’ve seen photographer Josh Rossi turn kids into superheroes before. When his three-year-old daughter received hateful comments after he photographed her as Wonder Woman, the photographer decided to use his creativity to send a message against bullying. He gathered fifteen kids who have been bullied and turned them into Avengers for a photo shoot. This project hasn’t only resulted in epic images, but it has also empowered the kids who have been facing bullying and hatred on a daily basis. It’s a dream for many kids to be their favourite super hero. Or to at least have their super abilities. Photographer Josh Rossi, however, believes that some already do. Along with his wife Roxana, and designer, Julie Whiteley, he set about finding them to photograph them. And find them they did. To use Josh’s words, these kids “have been through hell and back and have real superhuman strength”. After turning his 3 year old daughter into Wonder Woman last halloween, Josh decided that an epic super hero photo shoot was the way to go. His subjects were a group of children that live with some form of disability. The goal was to show off their inner strength in a way that would inspire others struggling with similar issues. As their creators describe it, “Project Grand Shadows is a digital photography comic book project about a homeless man, outsider in our society, who gets recruited to an experiment that goes wrong”. It’s an interesting story, but what’s even more interesting is that they’re illustrating it with photos instead of drawings. Obviously the project is about telling the story, but it’s also about the journey of making the comic. The whole comics with photographs thing has been done before, but usually not very well. The images in this instance, though, are rather good. Creating them presents a unique set of challenges, which is why they’re also documenting its creation. Photographing superheroes has become quite popular lately. Some use human subjects, while others use toy action figures, but this take on the superhero genre is very unique and fun. French photographer Sacha Goldberger asked some questions and, as a result, plunged some of the most iconic characters of recent memory into the 17th century with this fantastic photo series titled “Super Flemish”. Batman chose a life of solitude ( fancy cocktails aside), helping the community via shaded ops against mega crooks. 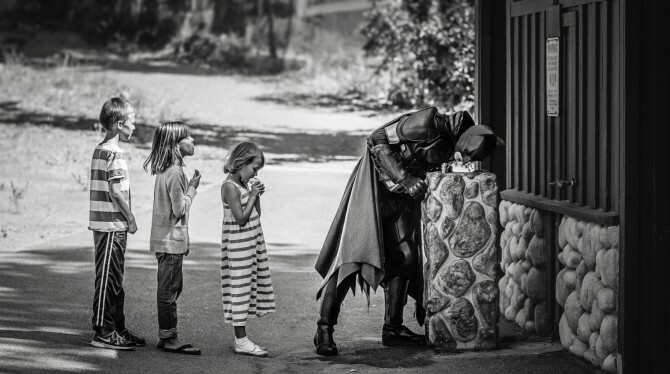 But what if Batman chose to blend in more and help not with the big-picture villains that threaten the city, but with the small things that can make or break our day on a smaller scale. Everyone wants to be a superhero. It is not easy to become one, but given the right opportunity, talent and time, it is possible to make it for a day. Photographer Benjamin Von Wong took an ordinary team of workers from Smugmug and granted them a day of superheroness. If you are like me you know what superheroes are doing for the brief 120 minutes that they are on the silver screen, but surely they have a life after the movie, and they face the same situations as we all do, don’t they? Photographer Edy Hardjo decided to find out. In his photos our favorite superheroes face jealousy, bodily needs and human emotions. Not without a healthy sense of humor. I wondered how the photos look so real. I guess using 1/6 detailed figures (like Hot Toys, Enterbay, 3A and alike, they those are not cheap and can easily go over $200-$300) have a big contribution to that, but Edy also told DIYP that he makes small modifications to the figures: “especially the hair. I change original the sculpted hair with rooted hair, to make it looked more alive. My friend do it for me, he is the expert“. And those modifications are well worth the effort.